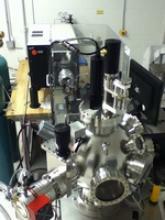 248nm Fluorine excimer laser with maximum energy output of 200mJ. Laser fluence values at target of approximately 1 J/cm². Laser is capable of pulsing at a max frequency of 20Hz. System is equipped with a turbo molecular pump and can achieve vacuum of approximately 10-7 torr. Deposition in Oxygen or Argon atmosphere is also possible.